This week, we’re taking the show on the road, taping in front of a Homecoming Weekend crowd estimated to be the largest ever assembled to listen to an episode of this podcast. Prof. Margaret Rubega (@ProfRubega) talks about what it’s like to be the official state bird expert, Baseball Coach Jim Penders recalls the time he threw an award into the sea, and we look back on homecomings past, complete with smocks. 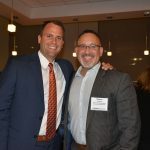 Alumni, students, faculty, and administrators from the Neag School of Education joined education professionals from across Connecticut last week for an evening of networking, followed by a panel discussion, at Hartford’s Spotlight Theatre. It was the fourth annual Educational Leadership Forum. Scholarships undoubtedly remain an essential source of support for individual students, but in fact they can also set into motion a wealth of other positive outcomes beyond funding an individual’s educational journey. 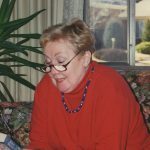 One such student scholarship is the Vivienne Dean Litt Memorial Award — established in memory of the late Vivienne Dean Litt, former assistant director of the University Program for Students with Learning Disabilities (UPLD) at UConn. James Kaufman classified creativity in four distinct ways: mini-c (personal insights), little-c (everyday creativity), pro-c (expert level) and big-c (creative genius). He said the kind of creativity exhibited by students with ADHD is often undervalued because it encourages others to be open to newness, which is scary for those who are accustomed to rhythm and order. Each year, the U.S. Department of State, the Center for Sport, Peace & Society at the University of Tennessee Knoxville, and espnW co-sponsor the Global Sports Mentoring Program’s (GSMP) Empower Women Through Sports Initiative. 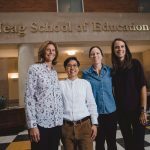 The Neag School Department of Educational Leadership’s Laura Burton, Danielle DeRosa, and Jennifer McGarry were selected to serve as mentors to an emerging leader from Vietnam, Tra Giang “Jane” Nguyen. Thumbs up to Brooklyn First Selectman Rick Ives and the town for honoring former Superintendent of Schools Louise Berry by renaming School Street in her honor. Norwich Tech has named Patricia King its new principal. King has worked in Connecticut school systems for more than 20 years as a teacher, department head, assistant principal, and principal. She served for 18 years as a high school Career Technical Education teacher and department head. She holds a sixth-year diploma in Educational Administration from the University of Connecticut.